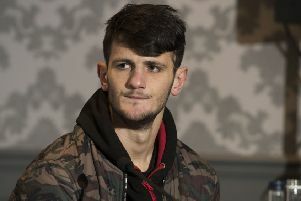 The Edinburgh fighter lost by a single point 96-95 at Glasgow’s Emirates Arena on Friday night, the second time in five months he’s been on the wrong end of such a contentious decision following the first defeat of his career when losing to Johnny Coyle in June. Prior to his summer setback, the 27-year-old had barely broken sweat as he racked up ten straight wins after signing professional terms with MTK more than three years ago. 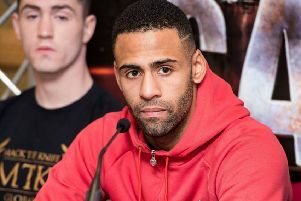 Benson, pictured, had described the defeat by Coyle in Belfast as “daylight robbery” but insists Friday night’s judgment was simply on another level. He revealed immediately afterwards in a live TV interview on BoxNation that those ten rounds against McKenna will be his last. And, having taken the weekend to reflect on his post-fight comments, he insists his viewpoint hasn’t changed. “I won the fight comfortably. I’ve watched it back and I still can’t believe the decision,” Benson explained to the Evening News. “It’s devastating. I said it on Friday after the fight and the same thing stands, I’m walking away from the sport. “I don’t want to have to build up for fights with no money in it. I’ve got my health to think about. I’d much rather have a healthier lifestyle and not get punched for a living, particularly when you get decisions like that. “I knew coming off the last defeat that it was now or never. I didn’t do anything other than prepare for the last ten weeks to make sure I got the win. I didn’t see my pals, I was in my house every night. I felt really lonely to be honest. Benson has welcomed support from compatriots Josh Taylor and Lee McGregor, who also believe that the 2014 Commonwealth Games representative had done enough to win by “a couple of rounds”. “Even though I’m calling it a day, my profile has risen because the support I have had since Friday has been unbelievable,” Benson said. “Even Johnny Coyle messaged me to say he couldn’t believe what he’d seen. “This is happening all too often in boxing now and it’s really going to start turning people away. McKenna knows I won. I’d asked for three judges and I never got it. Why there were only two I’ll never know. “I won the fight against Coyle too but that on Friday was just incredible. “I was in tears when I woke up on Saturday morning. It’s just not the way I thought it would end. I thought I’d achieve a lot more in the sport. I had a great amateur career but it just isn’t meant to be as a pro. “If I’d been beaten fair and square then you can accept that. But I ain’t willing to put my body through everything again just to suffer the same outcome. It’s happened twice now so it could happen a third time. “I should have been sitting here 12-0 with two good names on my record and on the verge of some really big fights. “But I’m now turning my back on the sport that I love. I’ve shown everyone I can mix it with the best in the division.